Going Through Your Day video: See our vision of a smart UX and understand how it can move you seamlessly from one task to another. GVP Ashley on Facebook: Jeremy looks at the role of emerging technology in building a better UX in this short Facebook video. IoT beer project: This wildly popular demo inspired videos, blog posts, and lots and lots of tweets. Media coverage included a post on Forbes.com’s OracleVoice, a video from Oracle Marketing, and another shorter video. On The Oracle Blog: Jeremy and GVP Gretchen Alarcon discuss the UX of Oracle HCM Cloud and what’s ahead in this post. 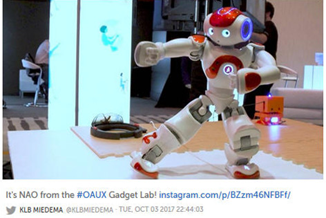 The OAUX Gadget Lab: Oracle Instagram posted this short video during Oracle OpenWorld. And updates to the OAUX Rapid Development Kits (RDKs) were announced just in time for Oracle OpenWorld. A new blog post on the OAUX Blog gives the details on these platform-based kits that offer a faster development path. OAUX friend (and Oracle ACE Director) Tim Hall also wrote about the RDKs in this post. And because we love chatbots, a new Conversational UI ebook is available. Go to tinyurl.com/OAUXConversationalUI for this specific RDK, including design guidance and a reusable wireframe template.